mumu Slide 2.0 Case For iPhone 4 and 4s World Exclusive First Look. mumu Slide Case For iPhone 4 and 4s World Exclusive First Look. by Mark — in In The News....Leave a Comment on mumu Slide Case For iPhone 4 and 4s World Exclusive First Look. It was purely by chance that whilst sipping on some brain juice in an attempt to get the grey matter firing I noticed a rather unique case that stuck out in the crowd of iPhones around me. Turns out I had stumbled onto a range of new wooden iPhone case from mumu* called the “Slide Case” which are coming soon and it looks like it’s going to be something rather special. Taking any opportunity to talk all things iPhone we set about chatting to the guys from mumu to see what we could find out about their upcoming release of the mumu Slide Case. The case is from the creative types over at mumu, a brand new start-up set to release their range of wood and eco friendly based products into the world, starting with iPhone and iPad ranges. What makes them unique is the ethos of the product. From their website ProjectMumu.com. 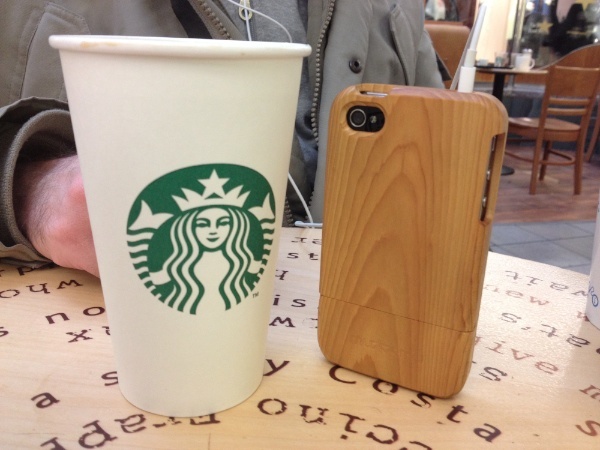 Designed and manufactured in the United Kingdom, the SLIDE for iPhone 4 and iPhone 4S is created from a single block of premium, quarter cut sustainable hardwood. Each case is expertly machined to exacting tolerances, hand sanded and oiled, creating an elegant case as unique as you. It was obvious after just a few moments of chatting to them the passion that’s being put into each and every case, setting it apart from the standard range of cases on the market. When I asked about the hand finishing, believe us on this, there is a lot that’s going into each case making every single unit unique. We got a few minutes of hands on time before they got a little concerned about the excitement levels of the team over the case and hands on I can tell you it feels fantastic. Every corner is rounded or tapered where needs leading to a feel of “less cutting in” that holding the iPhone naked. Weight wise, it adds practically nothing to the phone and with the slide case being wood there’s an added bonus that it slides nicely in and out of pockets. Anyone who’s used a rubber style case will get what I’m on about. You might think that being so light comes at the expense of strength or The feeling that it may be a touch brittle but with our few moments hands on it seemed to hold up nicely to our scientific “taking it on and off loads of times” test. Our final review sample will be with us shortly and when it does we’ll have full a full review up. *mumu. It’s Chinese for wood.